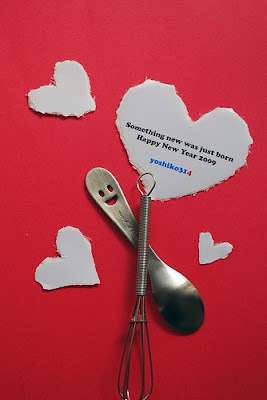 Everthing got a new start for 2009, so does my life in the kitchen. Life's beauty requires a sensative eyes to catch with, so don't let those little magic passing around you with no record. I need to continuously refresh the food recipe that I followed and make any better changes possible thus to make life full of surprise and joy. Life needs change once in a while. I would also choose kitchenware that with cute designs, which can pass me great mood when cooking. That's the four basic elements which makes our life. Food is the most important things of all. So if you can learn yourself a good skill of cooking, then so lucky for you and your families since you can enjoy life everyday, happiness is so close to you with those yummy food you made. Love your kitchen, love your family, love your life.